A visual field test in Boulder, CO measures how much 'side' vision you have. It is a straightforward test, painless, and does not involve eye drops. Essentially lights are flashed on, and you have to press a button whenever you see the light. Your head is kept still and you have to place your chin on a chin rest. The lights are bright or dim at different stages of the test. Some of the flashes are purely to check you are concentrating. Each eye is tested separately and the entire test takes 15-45 minutes. Your Boulder optometrist may ask only for a driving licence visual field test, which takes 5-10 minutes. If you have just asked for a driving test or the clinic doctor advised you have one, you will be informed of the result by the clinic doctor, in writing, in a few weeks. 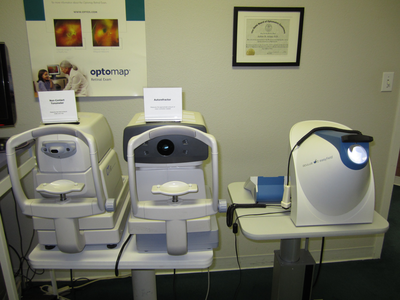 The optomap® Retinal Exam at our Boulder, CO office is fast, easy, and comfortable for all ages. To have the exam, you simply look into the device one eye at a time and you will see a comfortable flash of light to let you know the image of your retina has been taken. The optomap® image is shown immediately on a computer screen so we can review it with you.